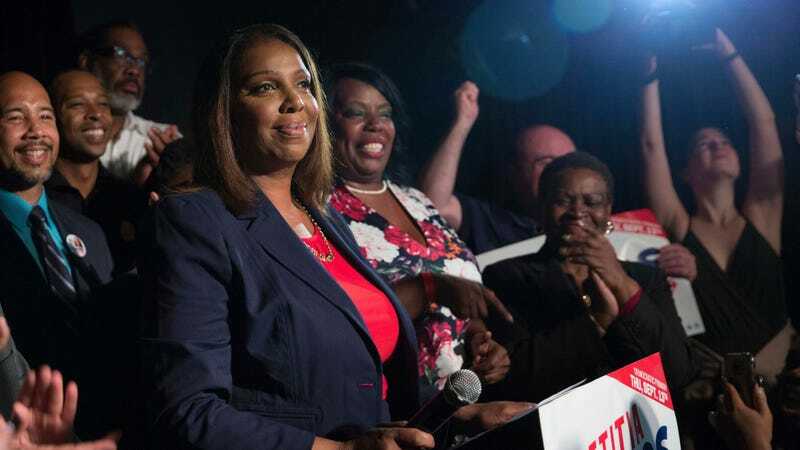 New York Attorney General Letitia James, seen here during the 2018 campaign season. The Times expose detailed how numerous celebrities—including actor John Leguizamo, football commentator Ray Lewis, and model-turned-entrepreneur Kathy Ireland, as well as hordes of dubious “influencers”—had bought followers and engagement on social media and content platforms from Devumi, a firm that ran a massive network of bots and sock-puppet accounts. Devumi ran those accounts to exaggerate clients’ reach and rack up fake likes and views on sites like Twitter, YouTube, SoundCloud, and Pinterest. The fact that some individuals whose prestige and fortunes rely on a perception of widespread popularity might choose to puff up their online profiles is blindingly obvious—but the Times article detailed the unsavory gristle of Devumi’s tactics, including sometimes stealing names and photos from real people for use in its bot and sock-puppet network. The fake accounts also served as fuel for sketchy for-profit promotional campaigns and endorsement deals, and even to astroturf politicians and government officials, the Times wrote. For instance, the company sold Twitter followers in packages of up to 500,000 for $3,997 and likes and shares in packages costing up to $228 per year. YouTube subscribers were sold in packages of 100 for $29 and likes on the video-sharing service were sold in packages starting at $30 for 250 likes. The NY Attorney General’s statement says that Devumi LLC and other companies’ use of “bot and sock-puppet accounts [that] falsely pretended to express the genuine positive opinions of real people,” and specifically those that “copied real people’s social media profiles without consent,” constituted a deceptive business practice. It also slammed the companies for selling “endorsements from social media influencers without disclosing that the influencers had been paid for their recommendations,” as well as deceiving some customers who had believed they were purchasing real engagement and the platforms themselves. Calas could not be reached for comment. His lawyer did not respond to repeated requests for comment. The settlement makes no determinations about whether Devumi’s clients violated any laws by doing business with the firm, CNN added. Gizmodo has reached out to the New York Attorney General’s office for comment on this story, and we’ll update if we hear back.